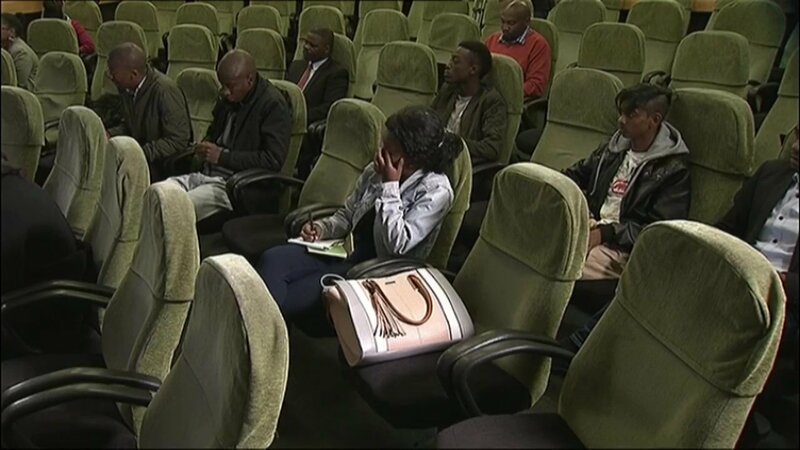 TV with Thinus: Some thoughts on the SABC's Thursday afternoon media briefing that was still bad - and badly attended - but better than the chaotic pressers of 2016. Some thoughts on the SABC's Thursday afternoon media briefing that was still bad - and badly attended - but better than the chaotic pressers of 2016. 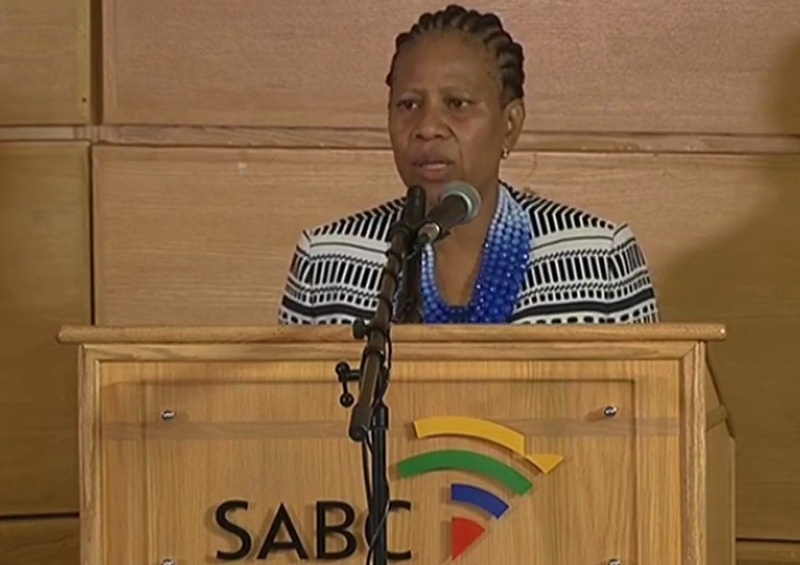 On Thursday afternoon the SABC held (yet another) media briefing at its Auckland Park headquarters in Johannesburg. 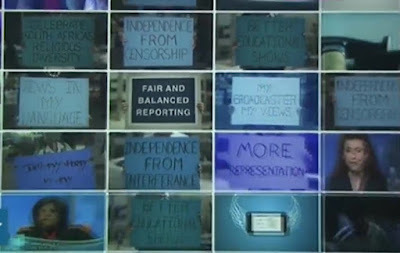 The SABC announced called the media to attend, to announce that the SABC is embarking on a new public policy review process to update 6 of its policies after the broadcasting regulator Icasa ruled that the SABC's 2016 editorial policy update was illegal because it failed to consult the public. 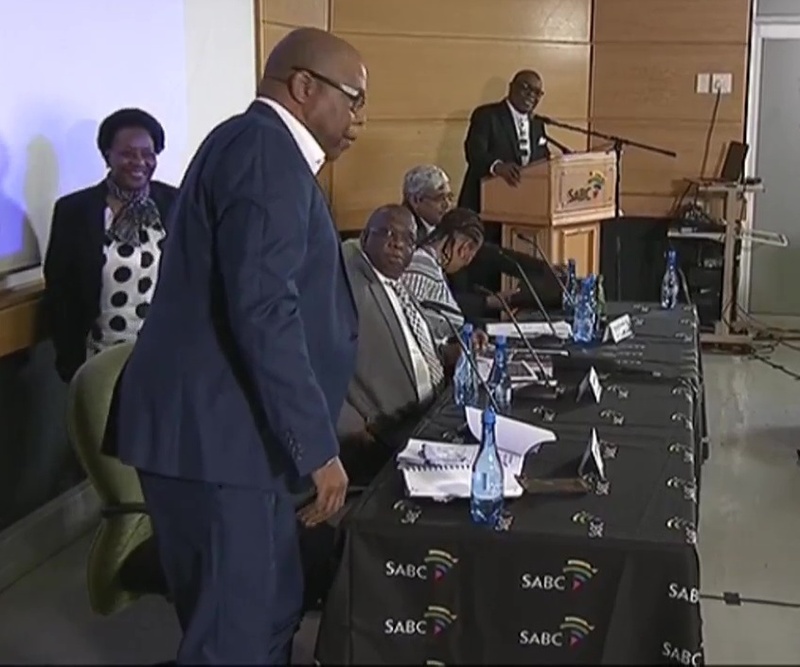 While the SABC's press conference on Thursday afternoon was still bad and very badly done - it's not just the SABC PR tsar Kaizer Kganyago's duo-chromatic satorial choices that seem stuck in the 80s - the SABC managed to do a better media briefing than all of the chaotic and unorganised trash pressers of 2016. The SABC continues to struggle with optics, and to get things - for instance its media briefings - to look "right". Whose problem and fault was that? Probably the SABC that seems out of touch. Only a few media outlets and journalists pitched - bad for something that the SABC presumably wants to get buy-in for, and wide exposure for. It doesn't seem as if the SABC's PR and corporate communications division really knows the media anymore, or has kept up with who the most relevant, correct media stakeholders are. The big problem for the bad attendance is the SABC's own fault and is twofold. The SABC's lack of credibility and failure to start on time. For a long while - right through 2015 and 2016 - the SABC absolutely destroyed its own credibility and its credibility when it comes to any professionalism regarding its media briefings. The SABC gave too short prior notification, went too long, allowed speakers to rant and rave, reacted with bombastic hostility to media and has a problem starting on time, making journalists wait after sending out urgent invitations. A lot of media I talk to say they're unwilling to make the effort to go to the SABC if it's going to be a mess. The SABC will have to put in real one-on-one work to (re)engage with editors and journalists. It's not something that will magically fix itself. It's terrible that the SABC announces something like a public review process for its editorial policies and can't get more than a handful of media to attend. Perpetually late, Thursday's SABC media briefing started almost on time - the best yet after a string of late starts for several press briefings. Hopefully this aspect will continue to improve, because media are no longer willing to go to the SABC for press conference and wait for an hour and longer with nothing happening and no updates. It's not even a basic courtesy issue. News editors and journalists have tight deadlines, and the SABC causes havoc by not having any sense of urgency and making it difficult for media to file stories,and with news editors wondering why journalists are away to do one basic press briefing story for so long. "I hope that today we have redeemed ourselves," said Khanyisile Kweyama, chairperson of the SABC interim board on Thursday afternoon. "The last time we had a press conference, we started about an hour and a half late. So in your eyes I hope we are improving". The SABC unprofessionally continues to drag out a bunch of people for media briefings as if the number of executives it puts on display somehow is supposed to - what? - visually show corporate ballast or that people are working? It doesn't work and signals an amateurish, childish approach to feign a type of "all hands on deck" image. It doesn't work and the SABC is clueless about how other broadcasters do it, while media laugh behind their hands every time the SABC does these kind of "hand puppet" shows. On Thursday the SABC once again looked amateur when it seemed it didn't even know how many people it was going to put up at its latest show-and-tell. After everyone were seated, here came Bessie Tugwana, acting chief operating officer (COO). Now there wasn't enough seats behind the black curtain table. So Philly Moilwa, the SABC's head of policy and regulatory affairs division, had to get up and go get another chair. 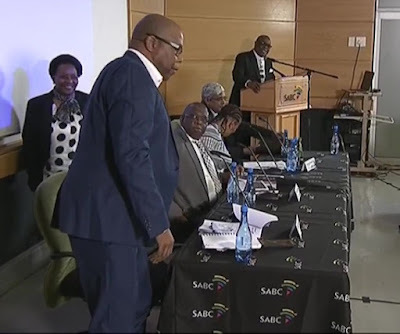 Question: Why is Bessie Tugwana there if the acting SABC CEO Tseliso Ralitabo is present? Redundant. Question: Why is SABC interim board member Krish Naidoo there (who didn't get to speak a word) if the chairperson of the SABC interim board is there? Superfluous. 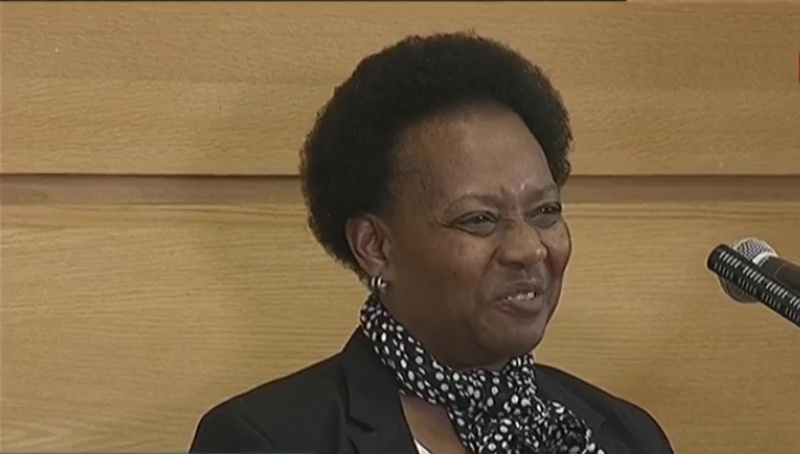 This whole presser could have been conducted by one spokesperson, and one person like Khanyisile Kweyama. Make it as easy and as singular as possible for the media to cover, and to get your message across. "Thank you chair for having stolen the thunder. She has actually given you the whole gist in terms of where we begin and where we end," said Philly Moilwa when he eventually got to talk, perfectly illustrating the problem the SABC keeps making. In the bigger overall scheme of things this is really a 0.001% problem and probably nobody but only the very, very eagle-eyed will notice or care. On Thursday afternoon the SABC showed two of its series of in-house TV commercials it will be running to alert people about the policy review process. Question: Why is there a spelling mistake in the (yellow) one? Interference isn't spelled "interferance". Question: Why are old SABC news readers and even Noeleen Maholwana Sangu of the former 3Talk included? They're not even on SABC TV anymore. Bessie Tugwana talks in a way where she doesn't come across as COO material. Her non-answer answers are so obtuse - just like in parliament - that one wonders whose idea it is to roll her out in front of the press. The SABC is far from digital but at least SABC spokesperson Kaizer Kganyago wore a black-and-white barcode tie that's almost, kind of digital. Bra Kaizer also continues to say stuff that's not quite true. 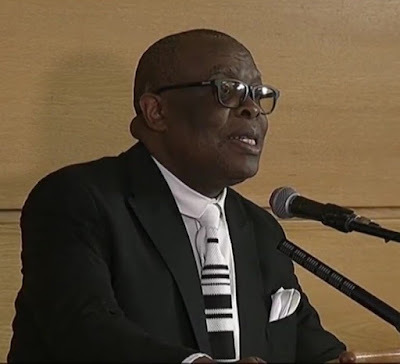 "People want to give an impression that the SABC doesn't care about local content," said Kaizer Kganyago on Thursday. Uhm, nobody has ever said that. "We are the ones that are developing the industry. We are the ones that are going out there to make sure that we get as much local content as we can," said Kaizer Kganyago. The fact is that the SABC is behind in paying local production companies. That doesn't develop but actually breaks and negatively impacts the industry.